It’s easy for us to convince ourselves that everything we have belongs to us when, in reality, it doesn’t. I was reminded of this foundational truth a few days ago when I stopped by the ATM at my bank to get some cash. When the menu of options appeared on the touch screen, I tapped on the requisite icon to withdraw $100.00. Within seconds five $20.00 bills emerged from the ATM. I reached down and pulled the money out of the dispenser, grabbed my receipt, and drove away. Later when I pulled the money out of my pocket I noticed that one of the $20.00 bills had the word “Church” written across one end. I smiled as I wondered about who might have written this word on the money and conjectured that it was probably a Christ-follower — someone who needed a simple little reminder that they are not the owner of all they have. I wish I could retrace the journey of that marked $20.00 bill. I imagine that the person who wrote the note placed the money in the offering plate at some point. Perhaps it represented a tithe of their earnings or just a humble offering. Regardless, it indicates an understanding that what we have comes from God and belongs to Him. In my quiet time earlier this week, I read these words spoken by King David on the occasion of a special offering designated for the construction of the Temple: “But who am I, and who are my people, that we should be able to give as generously as this? For everything comes from You, and we have given You only what comes from Your own hand” (1 Chronicles 29:14). King David and his leaders gave so generously to the cause that they inspired the people to do the same (1 Chronicles 29:9). They also understood that what they had given to God had, in fact, come from His divine hand. From my earliest days as a Christ-follower, I leaned the basic truth that God owns it all. I am simply a steward and not the owner of what comes my way. Like King David and his leaders, I have a responsibility to support the work of the kingdom with my tithes and offerings. If anyone ever looks at my checkbook they will see that my wife Cheryl and I really do put our money where our heart is. We invest in the kingdom. Call me old-fashioned, but I tremble at the thought of robbing God (Malachi 3:8-10). I am not a name it and claim it guy. However, I am someone who has learned that you cannot out-give God and that He is absolutely faithful to provide. 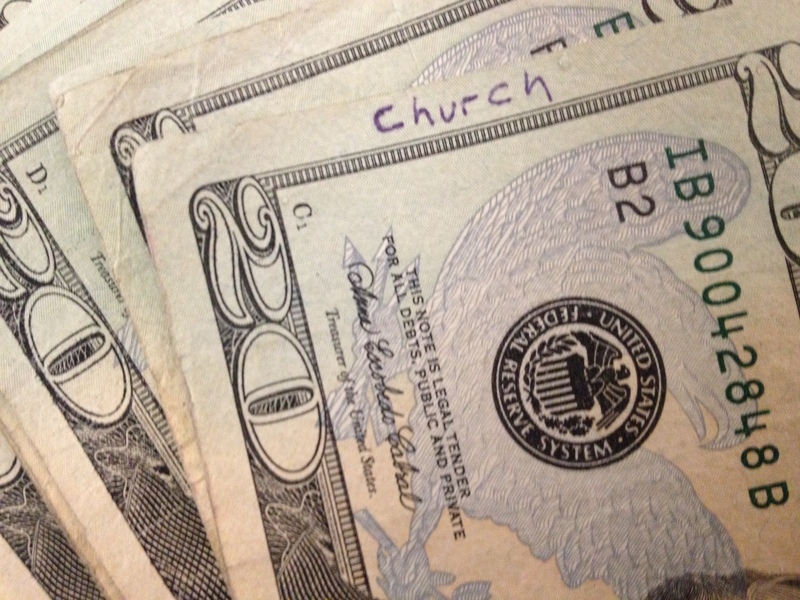 I’m glad that I ended up with the $20.00 bill marked with the word “Church” so that I could add it to what we already give to the work of God’s kingdom. If for some reason you have forgotten that you are a steward and not an owner, then write yourself a note on the margin of the bucks in your wallet to remind yourself that all that you have comes from God. Thanks, Mortuza. God’s people have to support God’s work. Great article!… and a great reminder that everything does in fact belong to God.